Palo Alto, CA – On Press Opening night, on the stage of the Lucie Stern Theatre, “Historian” ERIC BORCHES explains Medieval England to the audience as the martial music of the overture plays a trumpet fanfare for King Arthur. BORCHES continues talking in one corner of the stage, as the rest of the stage gets populated by a lively energetic group of actors singing and dancing “Fisch Sshlapping” a song from Finland. When their performance is over, the “Historian” informs, the actors that he was talking about England, not Finland. Correcting the mistake, the blue sky of Finland, turns gray, and crossing stage, we see a line of Franciscan monks reading their praying books as they walk, hitting their foreheads with them. We laugh, the fun, has just began. 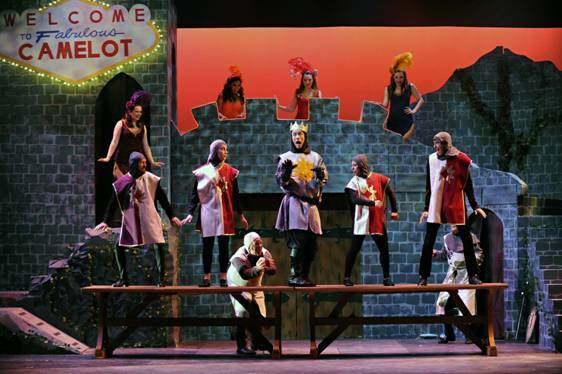 MONTY PHYTON’S “SPAMELOT” is a hilarious, and at times irreverent, musical populated by real and fictional characters such as “The Lady of the Lake”(JULIET GREEN) who surges from the center of the stage and is surrounded by dancing fairies. Other dancers in the play are “the dead.” Among the other characters are King Arthur, a “prince” who has the feelings of a princess. A Magician who loses both his arms in battle, without bleeding, and rhw King's knights who gallop around the world, riding invisible horses, at the beat of two clashing coconuts’ shells. During the performance, we visit a Camelot, that looks like a hotel in Las Vegas, experience duels and war, and are shocked by the ending of the “Killer Rabbit” who is blown up by dynamite, many centuries before Dynamite was invented by chemist Alfred Nobel in l861. In its plot, SPAMALOT parodies the folkloric and part invented tale of King Arthur (who lived in either the 5th or the 6th Century A.D) a legendary British leader who according to Medieval stories (not history) defended Britain against the Saxons. According to another legend, Arthur became king of England, when he was the only one who could remove Excalibur (as his sword is called) from the rock where it had been inserted, with the help of the Merlin the Magician. In SPAMELOT the musical, however, Arthur tells Sir Dennis Galahad (NICK KENRICK) a political radical, that he removed Excalibur from the rock helped by the magic power of “The Lady of the Lake” (GREEN) who in this story lives submerged in the lake. JULIET GREEN singing “What ever Happened to my part? Later on, and as a king, Arthur, (MONAGLE) goes around many countries searching for the strongest men and invites him to become knights of his Round Table and search for the Grail. 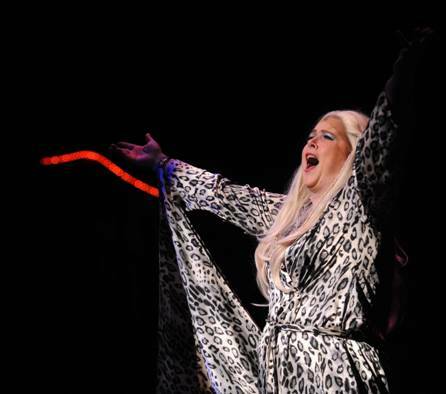 Another funny scene in the play, is acted by the same “comic” actor, this time playing the role as Prince Herbert. Apparently forced by his father to get married, he realizes that his “real love” is Sir Lancelot. Masterfully Directed and choreographed by ANDREW CEGLIO, “MONTY PYTOM’s SPAMALOT”, a new musical lovingly ripped off from the motion picture “MONTY PYTHON and THE HOLY GRAIL” from the original screenplay by GRAHAM CHAPMAN, JOHN CHEESE, TERRY GILLIAM, ERIC IDLE, TERRY JONES and MICHAEL PALIN, (as the program informs the audience) need to be seen, to be fully understood. The Palo Alto Players production, handles the humor perfectly and the scenic design of NIKOLAJ SORENSEN combined with the Lighting design of RICK AMERSON, manage to capture the atmosphere and mood of Medieval England. The mood is enhanced by the actors’ beautiful wardrobe, created by “Costume coordinator MELISA SANCHEZ. The sets, specially the ones representing castles are creative. In the musical part, the only “but” opening night had was in the control of the volume. At the beginning of the play the music was too loud and it overpowered the words of the historian in the first part. In the technical part all the dances were well coreographed and danced on time. The tap dances (STEPHANIE BAYER) were energetic and rhythmic, In the musical part, KATIE COLEMAN, got a full sound from the orchestra and marvelous notes from the singers. It helped that the tone of voice of Soprano GREENE, is marvelous, and the range of MONAGLE voice sounded rich in the low tones, and mellow in the high ones. The chorus singing Always Look for the Bright side of life.” was lovely. 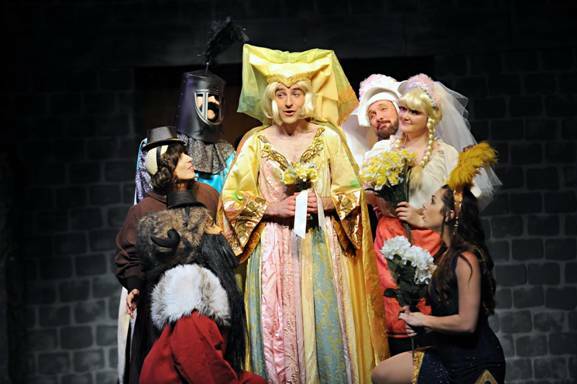 Produced by the PALO ALTO PLAYERS, as the fourth production of their 86th Season, MONTY PYTHON’S SPAMALOT, with book and lyrics by ERIC IDLE and Music by JOHN DU PREZ and ERIC IDLE, gives the audience a good production and an evening of laughter. 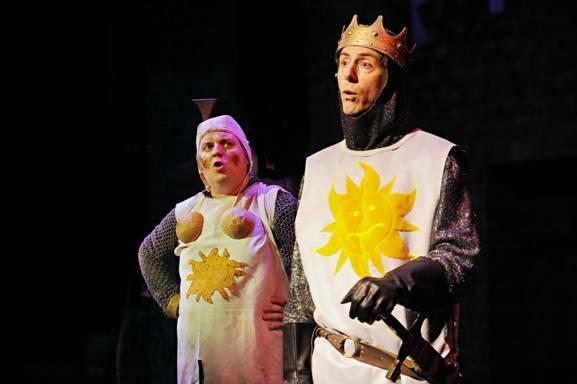 So those who enjoy going to the theatre to have fun, grab two coconuts halves, start clicking them against each other, and gallop to the Lucie Stern Theatre in Palo Alto to see MONTY PHYTON'S “SPAMALOT." Tickets may be purchased online at www.paplayers.org or by phone at 650-329-0891. The musical will play until May 14.